The answer is YES (you can)! It’s been a couple of weeks since our last progress report, so let me catch up…we had the very fine experience of finishing our plywood work on the roof! It went surprisingly well and Shawn was pretty comfortable up on the roof using his harness and ropes. We are still very pleased that we are not doing the shingling! We met with the man doing our roofing and it’s possible that it will be started late next week, which would be wonderful. There’s eventually a certain level of discomfort that comes from knowing your roof is only sort of on. In fact, eventually doesn’t really come into it. It’s just not fun to not have your roof on as the season gets older and September approaches. So we are looking forward to that good day when the roof is on! 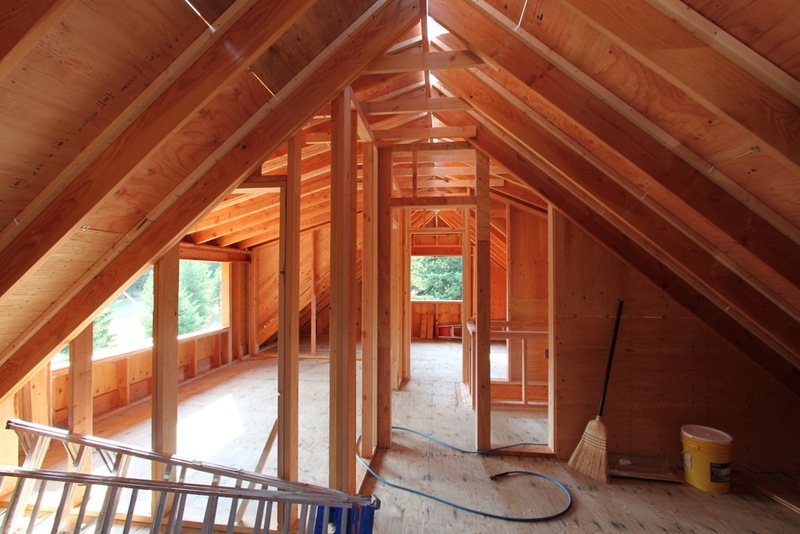 We also built many of the upstairs interior walls so that nearly everything inside is ready for eventual finishing. We took a couple of days off after finishing the roof work, they flew past and we were quite busy during them, but it was enjoyable to see friends and get to celebrate the milestone a bit. This week has been a bit of a blur. We had our first major inspection on Monday and it was successful. We were able to get approved to paper the house and also got clearance to move on with our insulation. Shawn is going to use the Scandinavian wall technique we used for insulation last time. This is a relatively simple but rather ingenious way of approaching insulation for better efficiency. The cavities of the walls are left entirely for insulation because the builder lays 2 by 2 furring strips across the insulated cavities in which to run wires. Plumbing (using pex lines) can be tucked against the insulated wall behind the furring strips without ever breaking the cavity. An added bonus is that wiring and plumbing are more accessible should they need to be. The 2 by 2’s offer enough protection for the wiring that you don’t have to worry about nailing into them. There also ends up being lots of anchor to screw in drywall or whatever you choose to panel your interior walls with. Once we satisfied the inspector that we had planned out our plumbing, venting and wiring in such a fashion that we wouldn’t obscure it by insulating, he was fine with giving us the go ahead. So we met with an insulation firm here and are in the process of getting bids on an insulation job using spray foam and either Roxul or Eco Batts. The spray foam will be very helpful to us in the upstairs ceiling cavities where we only have a 2 x 8 rafter to work with. This week after our inspection we got busy papering the house, finishing the four main walls and still considering how to paper the dormers. Then we installed rain screens over the paper on the walls which was a great way to use up nearly every last scrap of our half inch plywood. We cut them into two inch wide strips and nailed them over the wall studs all the way up the house. They’ll be a great surface for nailing our siding onto and will keep a lot of plywood out of the dump. We also finalized our window order and got that placed. Windows should be arriving in the first couple of weeks of September which is naturally very exciting. The prospect of being dried in is really something we’re looking forward to! Our time has also been occupied with finishing up small jobs around the house that will make things ready for both the roofing job and the insulation. That includes putting in collar ties, ceiling catches and wall catches were needed for drywall, and framing off the chase for the propane stove pipe to head up and out of the house. We met with someone at a fireplace store and have nearly decided on the propane stove we’ll be installing, so are preparing for that as well. Roofing has been ordered and should be delivered early this week. This week’s work will focus on continued small jobs and prep for the roofers. We need to finish mapping out where the plumbing stack will come out the roof and prepare for that. We also will tackle the dormer papering and perhaps will begin the garage door installation and get started on priming and painting the trim material for the decorative water table and corner trim on the house. It’s getting to be time to order our siding as well. All in all, there will be lots of small jobs that we’ll continue to tie up as we prepare to dry in the house for the season…hope you will continue to join us on the blog. Thank you for reading along!